Twitter Photo. 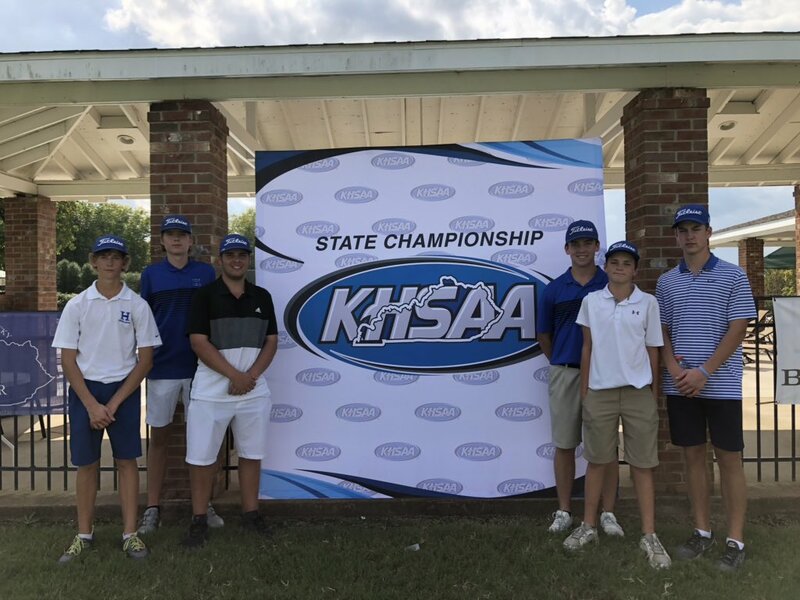 The Highlands Bluebirds boys golf team finished eighth in the state tournament shooting a two-day total of 644. The Blue and White made it to the last possible day of the season. With that goal crossed off, the Highlands Bluebirds boys golf team wanted to finish in the top eight at the state tournament. That last goal happened as the Bluebirds finished eighth with a two-day total of 644. Highlands shot 320 on the first day and 324 on the second day. The Bluebirds shot a combined 68 over par as a team on the par-72 course at the Bowling Green Country Club. "Every kid contributed," said Bert Richey, Highlands Head Coach. "In other sports, you can have a star carry and score a ton of sports (among other things). In golf, you have to have four kids play well if you want to excel as a team. We got off to a great start. We played better (Saturday) than we did (Friday) even though our score was higher. (The tournament organizers) lengthened the course and made the holes longer. The course was much tougher (Saturday)." Highlands finished 12th in the state tourament in 2006. Last year, the Bluebirds did not make the cut as a team, but sophomore Justin Gabbard tied for 20th in state. Highlands won the 8th Region Tournament this year. Sophomore Luke Muller led Highlands tying for 28th in the tournament individually with a two-day total of 154. Gabbard finished with a two-day total of 156 to tie for 36th. "In later years, we'll know it's like to have the course set up differently," Gabbard said. "The first day plays different than the second. It'll be a good experience for all of us." Seniors Ryan Leigh and Brady Walz rounded out the scoring for the Bluebirds. Leigh shot a two-day total of 166 to tie for 66th and Walz had a two-day total of 168 to finish 70th. Leigh said the players saw where the tees were put for the second day. Leigh also won the KHSAA Boys Golf Scholarship. Leigh, Walz and the other senior in Steven Grimme played big roles in watching the program rise. Leigh pointed out they were eighth graders when Parker Harris made an individual appearance in the state tournament in 2014 as a senior. "We thought by the time we were seniors, we wanted to be able to make it to state like (Harris) did," Leigh said. "So sophomore year, we knew we had time to improve. Then junior year, we thought we could get first or second (in region) and got to go down and see what state was like. Then this year, we knew what state was like. I'd say we reached our goals." The final golfer in eighth grader Joel Craft finished 82nd with a two-day total of 186. But Richey pointed out that Muller did not have a great state tournament last year shooting a 90. Aside from the region crown, Highlands won several tournaments including their own invitational. A couple weeks ago, the Bluebirds also captured the Northern Kentucky Athletic Conference Division II title. Highlands raised money to play all over the state including a trips to Bowling Green and Prestonsburg. "When I started (as head coach) three years ago, I had some things I wanted to implement to try to get the program to where we were a state tournament team every year," Richey said. "Some of those things were playing in more tournaments. The more experience you get playing in situations, especially in playing golf, the more success you have. I attribute a lot of the experience we gained this year to our results. We played at a lot of tough courses. We saw a lot of really good teams and it all prepared us for the region and the state. There's no mistake that the teams that make it are the ones that we saw everywhere playing in the same tough events." Taylor County rallied 10 strokes down on the back nine to win the state tournament with a two-day total of 592. State power St. Xavier finished runner-up with 594 and defending state champion Lexington Christian Academy took third with 602. Highlands returns three players with state tournament next year in Craft, Muller and Gabbard. Someone else will need to step forward to replace the seniors. Some candidates are sophomore Isaiah Lampkin and seventh grader Ryan Toole.